Lactic acid fermentation is a great tool that helps produce yummy pickles, it makes a recipe for sauerkraut, and beneficial fermented teas, just to name a few of these amazing fermented raw foods. When I looked up the definition of lactic acid fermentation in Wikipedia, the excellent explanation brought back visions (or shall I say nightmares) of biochemistry in college! To simplify the definition of this type of fermentation, let me just say that fermentation is the biological process that breaks down food into simpler components. The breaking down of food make the foods easier to digest and their nutrients easier for your body to assimilate. Since this type of fermentation does not use damaging heat, fermented foods are raw foods. Fermentation is an very ancient way of preserving foods. Today, it is used mainly to make unique foods that cannot be produced in any other way and for the taste and benefits of fermented foods. The fermentation process yields the desirable end product of fermented foods. These fermented foods are raw, naturally preserved, loaded with friendly bacteria, easy to digest and very tasty. Another by-product of fermentation is that the bacteria produces beneficial enzymes. 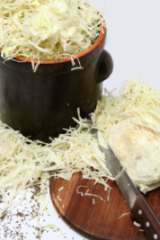 The health benefits of lactic acid fermentation are many, and go well beyond food preservation and the distinctive tangy taste. There are many health benefits, too. The bacteria that does the fermenting generates nutrients, especially B vitamins, including vitamin B12. Minerals are made more bio-available for uptake into your cells. Helps control and perhaps prevent infections of the intestines. Helps the digestion of lactose. Helps lower and/or maintain healthy blood cholesterol level. Breaks down food, making it easier to digest. Here are a few of the foods produced by the process of fermentation. These foods cannot be produced by any other method and they are all considered “raw.” Fermented pickles are far healthier then the traditional heat treated ones and they are yummy! Kombucha or fermented tea offers many wellness benefits. Various types of fermented vegetables, like kimchi, and sauerkraut add variety to the raw food diet. Fermented milk products such as kefir and yogurt are also produced by the process of lactic acid fermentation. Most if not all of the the foods commercially processed are not really good for you. If you want to add fermented foods to your diet, you most likely will come to realize that you will have to make them yourself. Generally, fermented foods are easy to make and the rewards are worth it. After you have made a single, successful batch of sauerkraut, pickles or your first batch of fermented tea, you just may feel like a pro. If you have been avoiding fermented foods, it may be time to start including these tangy tasting, bacteria-infused raw foods into your daily diet.